In order to allow a better assessment of group performance and greater data comparability, Snam’s management has developed alternative performance measures not provided for by the IFRS (Non-GAAP measures), mainly represented by the pro-forma and adjusted results. Further to excluding the special item, limited to the comparative periods (2015 and 2016) alone due to the discontinuity elements that characterised 2016, these results reflect Italgas Group’s contribution to continuing operations by applying the related 13.5 shareholding percent to the net profit of the Italgas Group for the entire year. Due to soundness of operational management and rigorous financial discipline, Snam achieved very positive results in 2017. Adjusted EBIT6 totalled €1,363 million, up €27 million (2.0%) compared with the same value from the 2016 financial year. The higher revenues (+€26 million, 1.1%), mainly attributable to the natural gas transportation and storage sectors, and lower operating costs (+€9 million, or 2.1%), also due to the effects of the Efficiency Plan (+€19 million), were partially offset by the increase in amortisations and depreciations for the period (-€8 million, or 1.2%), mainly due to the amortisation deriving from the entry into service of new infrastructure, which was partly absorbed by lower impairment of tangible assets. As regards business sectors, the increase in adjusted EBIT essentially reflects the positive performance recorded by the transport sector (+2.6%, + € +27 million). Adjusted net profit stood at €940 million, up €95 million (+11.2%) compared to the adjusted pro-forma net profit for 2016. 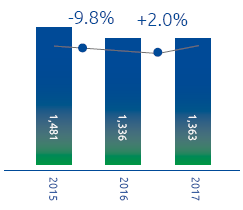 The increase, in addition to the greater operating profit, was due to:(i) lower net financial expenses (+€36 million, or 13.7%), which benefitted from a reduction in the average cost of debt, as well as benefits deriving from optimisation actions carried out during the period 2016 and 2017, in particular, the liability management operation completed in October 2016 and the financing operations carried out during the year, as well as the reduction in average debt for the period; (ii) higher net income from investments (+ €15 million, +11.1%); (iii) lower income taxes (+ €17 million, or 4.7%) mainly attributable to the reduction from January 1, 2017 of the IRES rate from 27.5 to 24.0%, partially offset by the higher pre-tax profits. Net financial debt was €11,550 million as at 31 December 2017, compared with €11,056 million as at 31 December 2016.The net cash flow from operating activities (€1.864 million) allowed us to fully cover the financial requirements associated with net investments for the period equal to €1.441 million, including investments in shareholdings, and to generate a free cash flow of €423 million. Net financial debt, after the payment to shareholders of the 2016 dividend (€718 million) and the cash flow deriving from the purchase of treasury shares (€210 million), shows an increase of €494 million compared to 31 December 2016, including non-monetary components related to financial indebtedness (€ 11 million). Our healthy results and solid business fundamentals allow us to propose a dividend of €0.2155 per share to the Shareholders’ Meeting, of which €0.0862 per share was paid in January 2018 as an interim dividend and the balance of €0.1293 per share will be paid from 18 June 2018 (record date 19 June 2018), confirming Snam’s commitment to an attractive and sustainable remuneration of its shareholders over time. Changes in the income statement results shown in the table, as well as in those later in this Report, unless otherwise indicated, must be understood as changes in the results for the adjusted 2017 financial year compared to the 2016 pro-forma adjusted year. Percentage changes are calculated in relation to the data indicated in the related tables. Entirely held by Snam shareholders. Calculated considering the average number of shares outstanding during the year. Figures for 2015 and 2016 have been calculated with reference to the net profit of continuing operations. Figures for 2015 and 2016 have been calculated with reference to the adjusted pro-forma net profit. The 2017 amount (relating to the dividends) is estimated based on the outstanding number of shares as at the date of this Report (13 March 2018). The figure for the 2015 financial year refers to the scope of consolidation of the Snam Group prior to the separation operation of Italgas. Figures for 2015 and 2016 were calculated with reference to the Group's net income (continuing and discontinued operations) of € 1,238 and €861 million, respectively. The official average price per share for the year 2015 refers to the historical average and does not take into account the price adjustment carried out following the demerger operation. According to the definitions in Borsa Italiana S.p.A.'s “Principles and Conventions", following the extraordinary transactions, in order to restore the continuity and comparability of stock prices, an appropriate coefficient to adjust the historical series must be applied. Therefore, the official price of Snam's stock relating to 2015 has been adjusted. The product of the number of shares outstanding (exact number) multiplied by the year-end official share price. The value for 2015 was calculated on the basis of the historical official prices recorded at the end of the year equal to €4.85, and do not take into account the price adjustments made following the demerger operation. The amount for 2017, representing the balance, was estimated on the basis of the number of shares outstanding as at the date of this Report (13 March 2018). At Snam, sustainability and the creation of value are strongly connected concepts. Sustainability creates value for the Company and stakeholders, and establishes a connection between the business and corporate social responsibility. The Company produces wealth by contributing to the economic growth of the society and environment in which it operates, and it measures this wealth in terms of added value produced and distributed to its key stakeholders. Snam calculates the added value taking inspiration from the standard prepared by the Gruppo di Studio per il Bilancio Sociale (GBS) and the GRI Standards. 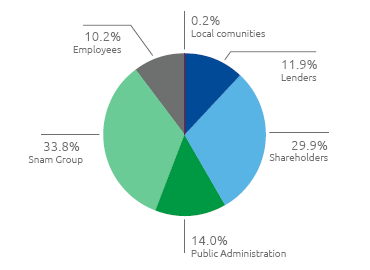 The table below is useful for understanding the Group’s economic impact and makes it possible to read the consolidated financial statements from the standpoint of stakeholders. In 2017, the gross global added value produced by Snam was €2,447 million: a slight reduction (€71 million, 2.8%) compared to 2016 (€2,518 million). The reduction is mainly due to the effects of the separation from Snam of natural gas distribution activities completed in 2016, which generated extraordinary financial income related to the repayment to Snam by the demerged companies, of the financial debts outstanding at the relative market value. 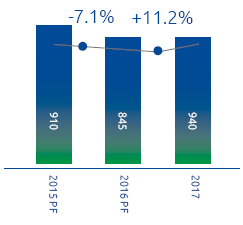 A total of 33.8% of the gross global added value produced by Snam was reinvested within the Group (in line compared with 2016: +9.8%), and intended essentially for the amortisation and depreciation of the intangible and tangible fixed assets used in the production process (100% in 2016). With regard to the main reference stakeholders, 2017 shows a stable incidence of Added Value distributed to employees (10.2%; -0.1% compared to 2016) through direct remuneration consisting of wages, salaries and employee severance indemnity and indirect remuneration consisting of social charges and personnel service costs (canteen services, travel expenses reimbursement), whilst there was an increase in the value destined for the Public administration through the payment of direct and indirect taxes (14.0%, +1.2% compared to 2016), mainly attributable to the higher pre-tax profit, despite the reduction of the IRES tax rate from 27.5% at 24.0%, which started on 1 January 2017.With reference to lenders, there was a reduction in the value distributed of 12.3% (11.9%; 24.2% in 2016) also against the benefits deriving from the optimisation actions implemented in 2016 and 2017, in particular the operation of liability management completed in October 2016.The value distributed to shareholders through distributed dividends is up (29.9%, +1.3% compared to 2016) despite the lower number of shares outstanding following the repurchase of treasury stock carried out by Snam as part of the share buyback program launched in November 2016.Lastly, an amount of approximately €5 million was designated for local communities (0.2% of the value generated) through donations and sponsorship initiatives and environmental compensation pursuant to the law. In addition, for the protection of the environment, Snam has incurred expenses for a value of approximately 120.6 million € (108.4 million € for investments and 12.2 million € for operating costs). 4 Unless otherwise specified, results for 2015 and 2016 shown below refer to continuing operations (transport, re-gasification and storage of natural gas) and, therefore, exclude the contribution of the natural gas distribution sector, represented as “discontinued operations” pursuant to accounting standard IFRS 5 “Non-current assets held for sale and discontinued operations”. To allow greater data comparability and in with a view to remove distortions arising from the application of the aforementioned principle, eliminations deriving from intercompany transactions towards discontinued operations have been restored to continuing operations. 5 For the definition of these indicators and the reconciliation of the economic ones with the related reported results, in line with the guidelines of the 2015/2016 ESMA1415 document “ESMA Guidelines on Alternative Performance Measures” of 5 October 2015, please refer to the chapter “Financial review and other information – Non-GAAP measures ”. 6 EBIT was analysed by isolating only the elements that resulted in a change to that figure. To this end, applying gas sector tariff regulations generates revenue components that are offset in costs. Those components mainly pertained to natural gas interconnections and transfers carried out for purposes of balancing the gas system. 7 These values include the restoration of continuing operations, for each item in the income statement, of the eliminations arising from transactions towards discontinued operations.